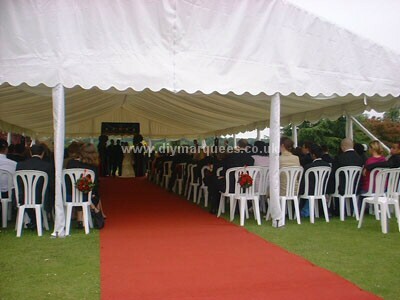 When we ran a marquee hire company most of our business came from the fact that people trusted us. At the end of the day people are booking a marquee with you based on their experience of meeting you, speaking on the phone, looking at your website and any literature/research/recommendations available. Throughout each of these steps you need to come across well and as an outfit that’s not going to let them down. A fundamental part of this is do what you say you’re going to do. If not then how can you be trusted to put a marquee up even though you say you will? If you make an appointment for 10am on Tuesday make sure you’re there at 10am on Tuesday (I’d always aim to be sat round the corner 10mins before in case of traffic). If you’re going to be late for the appointment then phone with a realistic ETA. If you say you’ll get a quote out today, get that quote sent out today! This is all fresh in my mind as we sold a marquee and some equipment to a customer this week who was only buying one because he’d been let down by his local marquee hire firm. He phoned up asking for an appointment and was told as he’s only round the corner the marquee man would pop in on Friday evening. Didn’t happen. Customer phoned, was told definately the following Friday. Didn’t happen. You get the picture. So please remember your business is judged on the image of your business, people aren’t coming along to buy a product from you, they’re buying a service. You don’t just need to provide a good, reliable and value for money service you need to be SEEN to be providing these things. Your website, attitude on the phone and manner when in a meeting must be that you’re there not only to help, advise and serve but that you’re capable of doing so.